Motor riders love going almost everywhere with their motorcycles. But imagine one day you turn the key in your motorbike, and nothing happens. How frustrating can that be? If that has happened to you, then you understand how important it is to have the best battery motorcycle charger. With a good charging device, you’ll not only be able to charge your low power battery but also keep it on optimal levels. But because there are many different models in the market, it can be quite challenging for you to make an excellent choice. It’ll, therefore, require you to spend a significant amount of hours researching the different models. The good news, however, is that you don’t need to waste your time. Through the help of our experts, we have analyzed the best-selling brands, their capacities, and features as well. 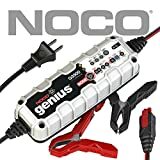 Check out from this list the top 10 best motorcycle battery chargers to buy. Nothing beats a 12V automatic battery charger. It features four charging stations that you can use according to the needs you have. This lightweight, fully automatic charging device will charge your battery within a short time. Don’t worry about your battery overcharging. You can peacefully leave it charging at night since the charger will automatically switch to float mode once it is full. We recommend this model not only because it is a fast charger, but it also allows for the optimization of battery power without overcharging. Using this charger, your battery is taken through the 4 charging program that is the Initialization, Bulk Charge, Absorption Mode and Float Mode. There’s also the solid state two colors LED indicator, from where you can check the state of the power. So this isn’t just an ordinary charging device. Furthermore, you are given a Five-year warranty. So there’s nothing to lose if you decide to try it. After all, you can simply return it if you aren’t satisfied with the product. Trickle chargers have been in the market for so long. And people love them because they can keep the batteries of their cars or motor bicycles charged and ready to use. But finding a good model is where the catch is. The good news is that there are a variety of reputable manufacturers selling trickle chargers. And one of them is Foval. Well, it may not be a very famous brand, but you’ll be surprised at how good the quality of their products is. The charger comes with multiple incredible features. To begin with, there is the spark proof during lead connection, the reverse polarity is protected not to mention an 8-foot output cord is also included. What’s not to love about this product? You can use this device on all lead-acid, flooded as well as sealed maintenance free batteries. Just like Battery Tender, this one too follows the 4 step charging program. What we love about this battery is it is small in size and suitable for almost all motorcycles, RVs, boats, and nearly all other vehicles. The charger will switch to float maintenance once your battery is full so there’s no risk of damaging your motorbike’s battery. It also features LED indicators that display the state of charge and diagnostic information even when the maintenance mode is on. It is lightweight, easy to use and most importantly automatic. Plus, all buyers are given a 2-year warranty. There’s nothing that beats a charging device that can charge your battery for up to 120amp-hours. And that is exactly what this model gives you. There are lots of other things to love this charger for. For starters, it is a 6V and 12V battery charging device. If your battery fits within that range, this is a must-have charger for you. It features a sleek design with a spark-proof technology and reversed polarity. The overcharge protection feature is also included. 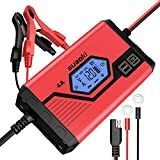 This product stands out as it can safely charge a range of devices such as RV, ADM, powersport and lawn batteries as well as your motorcycle’s battery. 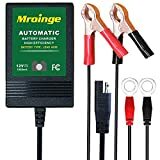 One of the best things about this particular charger is that it actively monitors the battery health and even if you have a discharged and sulfated battery, it’ll automatically repair it. Plus, it is among the most affordable chargers in the market today. This charger made it to our list for so many reasons. Let’s be honest, we all appreciate a fast charger. No one wants to spend so much time waiting for their battery to charge up to its optimal level. Plus, we’d really hate a charging device that overcharges our battery hence reducing its lifespan. Well, these are just some of the reasons why you need a SUAOKI car battery charger. Where this model beats other brands is that it factors automatic voltage detection which simply means that it detects the need for either 12V or 6V output. Safety is not all, the charger follows the eight stage charging process and comes with an LCD Screen that displays the charging voltage, current as well as battery type. With the ability to restore the last settings once it is on and multiple protection features, this charger will make your riding life much more comfortable. Schumacher can be considered as one of the best options in the market. 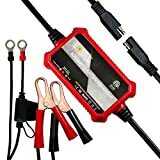 It is a uniquely designed charger that is best for lead-acid batteries. For added precision, the charger has a controlled microprocessor with multi-stage charging included that ensures that your battery safety and life is protected. It remains to be the top choice of many motor cyclers as it comes with an automatic voltage detection to detect 6V or 12V batteries, Float mode monitoring to maintain the battery at its optimum charge and reserve hook protection that ensures the safety of both the battery and the charger. Is your battery voltage between 6V and 12V? If you answered yes, then this charging device is the ideal one for you. It stops charging automatically once you have a full battery and switches to float mode. It also has in-built protection to safeguard your battery from overcharging, reverse polarity and short circuit. The charger is ETL certified. It has high efficiency and a built-in mounting bracket for easy placement. Spark proof during lead connection, reverse polarity, short circuit, and temperature protection are some of the reason why you should get yourself this charging device. To make your work easier, the charger comes with big battery clips and o rings terminals that you can use to connect to motorcycles battery. It follows a 4 step charging program that ensures safety for your battery. And just like the rest above, it comes with an automatic charge cycle functionality that switches to float mode once your battery is fully charged. The LED displays each stage of the charger. And you are also given a 2-year warranty. There is nothing as good as a smart charger. It makes your cycling life enjoyable. LST charger can charge a variety of vehicle batteries including Lawn Mover, cars and obviously your motorcycle. We love its ultra-compact design and its lightweight nature. You don’t need to be an expert to figure out how to use it. 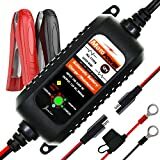 It includes LED indicators and 2 DC connectors that show the state of charge and diagnostic information even when float mode is on. Plus, you are given a one year refund and after sale services. A good charging device will make you love cycling your motorbike. But a bad one can make one dread to use their motorcycles. That is why it is essential for riders to get this charger. If money is not an issue, you can buy yourself this product for so many reasons. The charger is versatile, it can charge a range of devices. It comes with multi safety protection and battery recover and rescue. Like most chargers, it follows the 4 step charging program, and it automatically switches to float mode to prevent your battery from overcharging. The charger is not just a fast charging one, but it is also waterproof. And you get a 100% money back guarantee. Plus, you get to enjoy the after sale services more reasons to get your automotive charger. Last but certainly not least is this charger from Motopower. It is certainly an affordable one and features a sleek design. You can use it on all types of 12V lead-acid whether flooded or sealed maintenance free batteries. It factors a microprocessor that monitors all the charging to ensure that your battery is protected. It is also an energy-saving design and has multi-level safety protection and battery rescue. Get this automatic charger that comes with an LED screen to display the state of charging and a 2-year warranty. It can be overwhelming to determine which car charger is best to buy and one that perfectly meets your needs. And because there are so many chargers in the market, it’s not hard to get a little lost along the way. Before you head out and purchase a charger, here are some few things you need to put into consideration. There are two kinds of chargers sold in the market: the trickle chargers or smart ones. A trickle charger offers an inexpensive way of charging your battery. If you are there to supervise the battery, you might enjoy using it. But the only drawback is that it always apply charge to your battery even when it is full which can overtime damage it if this continues over a long period. However, a smart charger can be expensive, but they are preferred because they are automatic. Once your battery is full, the charger stops applying current. Battery cells are grouped into three. We have the liquid battery that can be charged by almost any charger which makes it the perfect one. But there are also thee gel batteries which if you are having one, you must ensure that your charging device includes curves, IU, IUOU. There is also the deep cycle battery which will require a special charger to charge it with a specific “deep cycle” program. 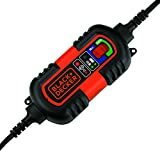 Even if you are looking for a motorcycle charger, it’ll be helpful if you buy one which can also charge other vehicles as well. And the good things is that there are a few brands which sell such models. These chargers not only work on multiple vehicles but they also feature a variety of charging modes. For instance, you can decide to buy a microprocessor controlled device that factors in the 3 or 4 step charging stages. Also, consider if the charger comes with desulfation mode. This feature allows it to effectively and safely revive a dead lead-acid battery. Batteries are marked with their capacities. When buying a charger, it is essential that you first determine what your battery capacity is. It will be a waste of money to buy a charger that can’t charge your battery because it has a lower voltage or one that can easily damage your battery because of its high energy. 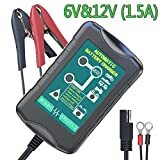 Most chargers range from 6V to 12V. There’s no need to buy a complicated model that will give you a hard time using. It is recommendable that you buy a simple charger that doesn’t require you to start referring to the manual on how to use it. Again look at the safety consideration of a particular brand. Remember a charger is something that you’ll be using on a regular basis. So you have to ensure that it protects your battery. Some of the safety features to look out for include short circuit and overcharging protection as well as reverse polarity. Don’t endure the inconvenience caused by flat batteries while you can get one of the chargers we’ve reviewed above. 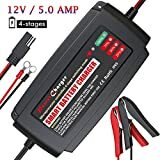 However, before you walk out of that store with your new charger, ask yourself does it have the proper voltage to work with the battery system in your motorcycle, will it protect my bike, is it easy to use? If yes, then you can confidently purchase it.